Understand How to Rotate In Volleyball, Its Easier Than You Think! You will learn how to rotate in volleyball easily with the explanation on this page. 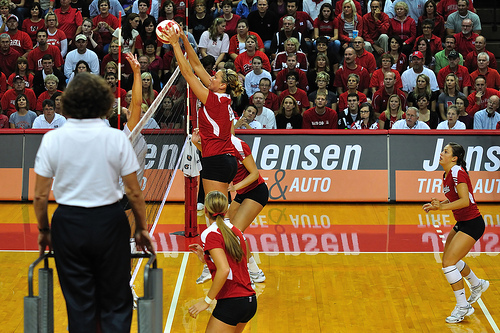 A volleyball rotation occurs when the non-serving team wins a rally. They earn a point, the right to serve and the right to rotate. The team that wins the right to serve at the end of a rally will rotate. The team that lost the point will not rotate. Front row players move one position to their right. The right front player in zone two will rotate back to the zone one position and step behind the service line to serve. Back row players will also rotate, but one position to their left. The person in middle back position which is Zone 6 will rotate to their left to Zone 5 the left back position on the court. The left back position in Zone 5 will rotate up to the front row to now be in Zone 4. In this sport players are required to move clockwise to rotate. Players who start in zone 1, which is the serving area located in the right back, after their team wins the right to serve, that player would then slide to the left to move into zone 6 which is the middle back area. When it's time to make the next rotation, that same player slides to the left again to the third position in the back court which is the left back area also known as zone 5. 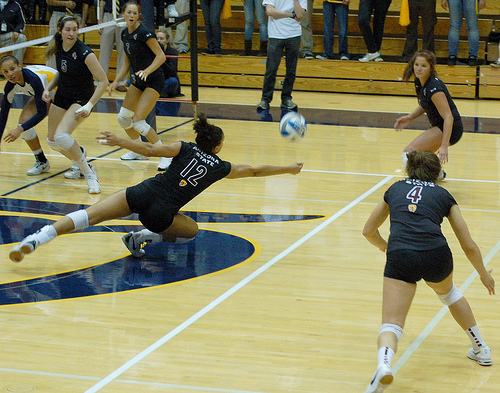 The primary responsibility of the players in the back court, also called the back row, is to play defense behind their blockers who're at the net attempting to block the ball in the front row. 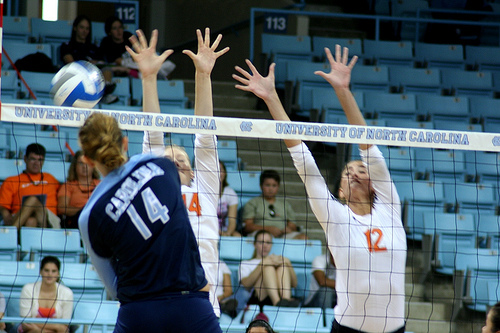 In serve receive, the responsibility of the back court players is to receive serve, so the front row hitters can run their offense. In the picture below, the dark green line that's a few feet in front of the back row players is the ten foot line which divides the front court from the back court. 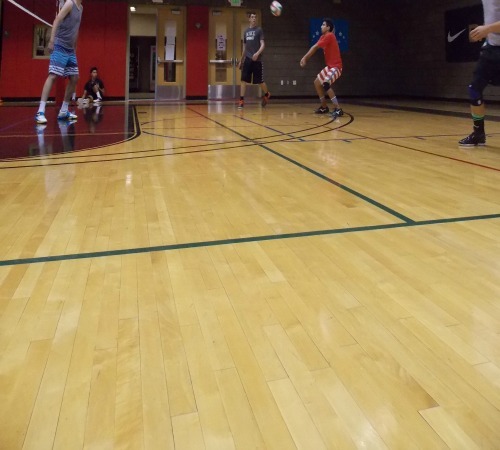 Volleyball Rotation: The Ten foot line separates the back court from the front court. If you are a player in one of the three back row rotations you are allowed to hit a ball across the net as long as you don't cross the attack line while doing so. 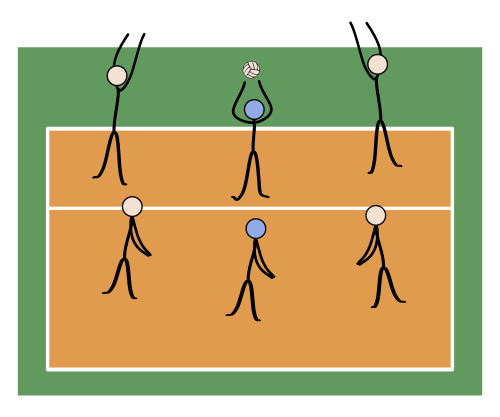 The volleyball rotation in the back court starts in Zone One (right back), then goes to Zone Six (middle back) then goes to Zone Five (right back) before a player will rotate up to the front row. 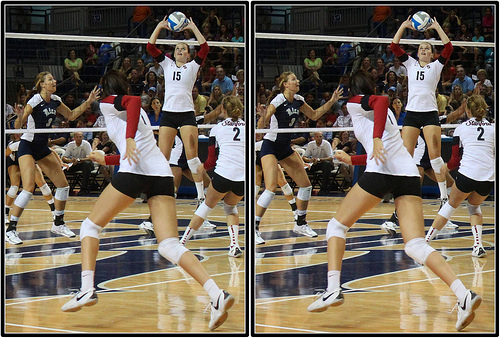 The volleyball rotation in the front court starts in Zone Four (left front), then goes to Zone Three (middle front) then goes to Zone Two (right front) before a player will rotate to the back row. To be more specific the front court, also known as the front zone extends from the center line, that's the line that runs parallel and underneath the net, to the very far side of the ten foot line. On its sides, the front court extends outside of the sidelines all the way to the free zone. The front court contains three of the six zones that a player rotates in and out of and in each zone the front row hitters are allowed to either hit or set the ball if they're on offense or block the ball or dig a ball if they are on defense. No one is allowed to serve a ball from anywhere in the front court. Zone 2 is the right front area and is where the setter usually plays when she is front row. This can vary depending on the offense a team is running but most of the time a setter will be right front when she's on defense in the front row. Zone 3 is the middle front area reserved for the player specialized in hitting from the center of the net and is called the middle blocker or middle hitter. In Zone 4 (my zone yayy!) is reserved for the player who is specialized in hitting the ball from the left side in offense and is also the left side blocker when the team is on defense. Learn more about the game and How To Play in the Related Links below. Or visit the pages in the How to Play section in the drop down menu at the top of the page.